StorURL is a customizable bookmark manager that can import from most popular browsers or add manually. Bookmarks can be then organized in a unlimited number of categories. The program includes verification, the ability to launch in a custom browser, grab website icons, search, always remain on top, minimize to tray (with bookmarks launched from the tray), floating tool-bar, password-protection and more. Supported browsers include Firefox, Internet Explorer, Google Chrome and Opera. Bookmarks can also be imported from StorURL Online if registered. How to extract: Download the "Portable Edition" ZIP package and extract to a folder of your choice. Launch StorURL.exe. 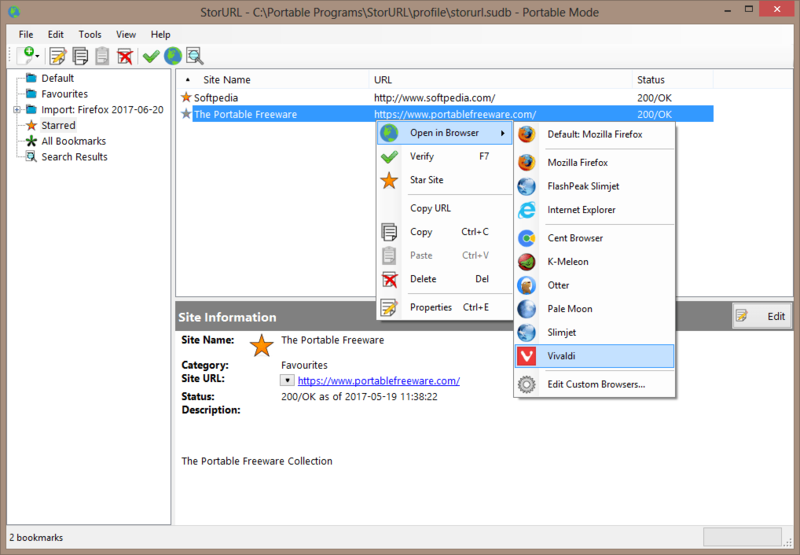 StorURL may work under Windows XP/Windows Vista, testing and confirmation would be welcome. URL Monitor is a bookmark manager that collects and verifies URLs (anything that starts with http://). The program monitors the clipboard for links and adds them to an internal list. Links can be opened, verified one at a time or in bulk, or exported to a list (html/text). 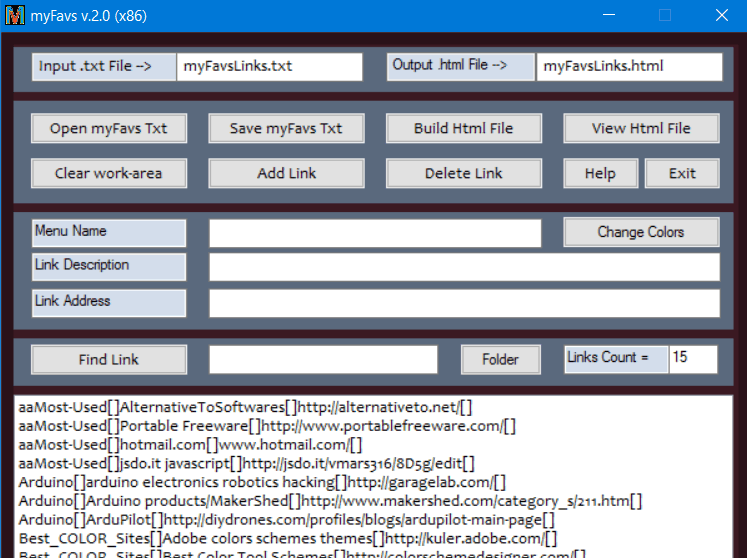 The program can also import links and lists of links in text/html files via drag-and-drop. Writes settings to: None. On demand to the Application folder in an ini file and the default URL list via respective button. How to extract: Download the ZIP package and extract to a folder of your choice. Launch URLMonitor.exe. Capture of FTP URL possible if accepted by the FTP site. Hi Midas. To answer your question. The comparison is not really a good idea. These softwares have two different goals in mind with a common task to achieve their respective goal. Xenu Link Sleuth ATM crawl a site given a URL and perform a complete site URL check with complete report on demand. And it does it very well. URL Monit@r on the other hand does also a verification of URL but its goal is bookmark managing whatever come has URL captured by the clipboard and it does its task very well. Verification of URL here is on a case per case or thru a given list or complete URL list via the integrated browser (Xenu can also import a list of URL). Both program check URL but for two different goals as I said before. However you can check evolution of URL Monit@r here http://www.geocities.ws/tactictoe/URLMonitor_Progress.html. It will include functionality of Xenu Link Sleuth ATM without challenging this excellent software or trying to superseed this software neither copycat the work of this excellent software. The story of URL Monit@r is not finished. It stills evolves. Anyway thank you for asking, it needed to be asked as some people might be confused. So if you need a temporary bookmark manager for long internet session research URL Monit@r is your software, on the other hand if you need to verify a whole website with report Xenu Link Sleuth ATM is your software. Please also note Xenu Link Sleuth ATM is very light in size where URL Monit@ar is more hungry in mass storage size because its modern icon driven needs for functionality. I could have go all the way with menu and speedbutton with little size glyph to reduce the size to 1Mb but it would have reduce the appeals of the software dramatically. FavoritesView displays a list of browser favorites (Internet Explorer) and bookmarks (Netscape/Mozilla) in a single page. Each line in the list specifies the title of the item, the URL address, the created/modified date of the bookmark item, and the folder name. You select one or more of these bookmarks, and then copy them to the clipboard, delete them (Only for Internet Explorer Favorites), export them to tab-delimited text file, HTML file, or XML file. The program also allows you to locate duplicate URL addresses in your Favorites/Bookmarks or find specific item by specifying the URL or the title. How to extract: Download the ZIP package and extract to a folder of your choice. Launch faview.exe. cool,you can use select ".\Favorites" and carry your IE links around with you on a usb in the portable's folder. Too bad it doesnt allow you to select your own default browser to launch links with. 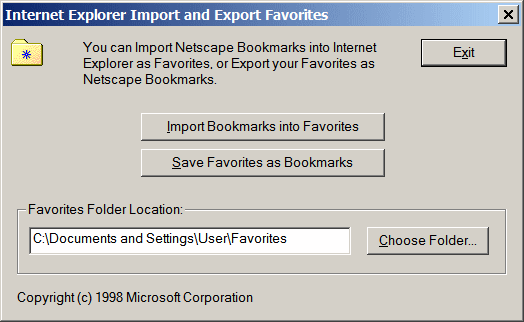 FavTool (Internet Explorer Import and Export Favorites) is a small utility to convert Netscape Bookmark HTML files (used by Firefox) into Microsoft Internet Explorer favorites and vice versa. The latest versions of Internet Explorer do include an import/export wizard, but some IE-based browsers may not have this function, so this is still a handy tool to have around. How to extract: Download the EXE to a folder of your choice. Launch favtool.exe.